A golf buddy of my husband loves model trains. He belongs to a local club and they put on volunteer displays. 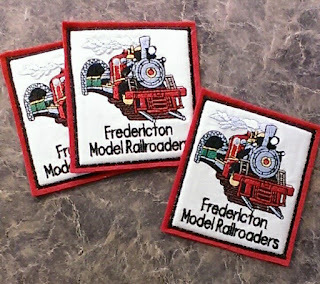 He has looked into having a train design stitched on to sweater/vests for the himself and the other train enthusiasts. They would wear them when they do public events and exhibitions. At the local embroidery place, the setup fees and the low number required made it too expensive. In talking to him, I suggested that a patch might be the way to go. He thought that was a great idea and the guys could buy their own sweater or vest, then simply apply the patch. So, with his help in picking out the right train design, I stitched out a sample. He was thrilled. This is not something I would normally do, but this guy has helped us out lots. And it's nice to return the favor.